"We regard Sri Lanka's President Ms Chandrika Kumaratunge's public apology for the 1983 pogrom against the Tamils as a deceptive attempt, driven by political expediency rather than principles, to placate the Tamils," said Mr.S.Elilan, Trincomalee district political head of the Liberation Tigers of Tamil Eelam (LTTE) speaking as the chief guest at a public meeting in Trincomalee Sunday evening held at the Welikada Martyrs Memorial Hall in Trincomalee to remember the 21st anniversary of Black July. "It is politically convenient for Ms Kumaratunge to blame the United National Party (UNP) which was in power during that period. Has she forgotten that her father was in power when the first communal riot broke out in Sri Lanka in 1958? Why has Ms Kumaratunge failed to apologize for all ethnic riots and massacres of Tamils by government forces during her regime and when her father and mother ruled the country? Crimes were committed against Tamils under the chauvinistic politics of Sinhala leadership of both parties," Mr.Elilan said. "Instead of engaging in duplicitous politics, Sinhala political leadership should come forward to agree to a permanent political solution to the ethnic conflict with self-rule concept satisfying the legitimate aspirations of Tamils of the northeast province. Failure to do so will force us to go our own separate way," Mr.Elilan said. 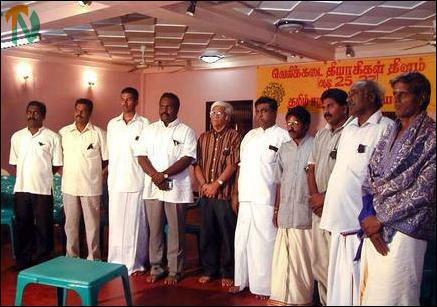 The Tamil Peoples' Forum (TPF) and Tamil Eelam Liberation Organization (TELO) in Trincomalee organized the event. TPF President Mr. V.Vigneswaran presided. Secretary Mr.Eelathumani gave the welcome address. Mr.Elilan said that only because of the armed liberation struggle launched by LTTE Tamils today are able live without fear and with self-respect. "In July, 1983 Sinhalese hoodlums with the blessing of the then government in power unleashed violence against innocent Tamils, killing them and destroying their properties in Colombo and other parts of Sri Lanka. "In July 2001 when the LTTE attacked on the Katunayake international airport causing severe damage to the country's economy there was no violence against Tamils. There were no communal riots when LTTE overran the Mullaitivu SLA base killing more than 1000 Sri Lanka government troops. Sri Lanka has not seen any major communal riot in recent times only because of LTTE's military strength," said Mr.Elilan. "We do not like war. We are not looking to start another war. In the past, war was thrusted on us. We still hope for a positive change in the stalled peace process and that talks will resume soon," said Mr.Elilan. Mr.Appapillai Vinayagamoorthy, President of All Ceylon Tamil Congress (ACTC) and former parliamentarian said that no judicial inquiry had been held into the massacre of 53 Tamil political prisoners in Welikada prison in July 1983. "Why President Ms Chandrika Kumaratunge who is apologizing for the Black July crimes has failed to order a judicial inquiry into the Welikada massacre?" he asked. Parliamentarian Mr.Selvam Adaikalanathan said Sinhala main political parties are not genuine in their attempts to solve the ethnic conflict even now after a costly and brutal war for the last two decades. 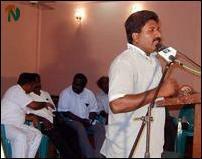 Batticaloa district parliamentarian Mr.S. Jeyanandamoorthy said there was no place in the eastern province for regionalism. Parliamentarians Messrs S.Noharathalingam, Sivasakthi Anandan, and M.K.Sivajilingam also spoke. Mr. Indrakumar Prasanna, TELO Secretary General proposed vote of thanks.